Thrifty and Frugal Living: Sears Hometown Store V.I.P. Contest Feb 17- 22 $1000 Grand Prize! Sears Hometown Store V.I.P. Contest Feb 17- 22 $1000 Grand Prize! 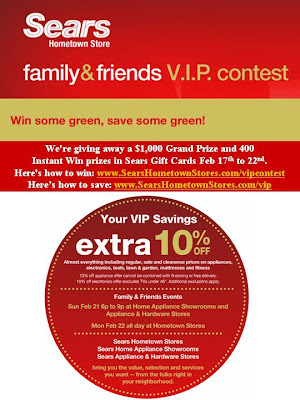 Starting tomorrow Sears is going to have a VIP contest where you could win $1000 Grand Prize! There are also going to be 400 Instant win prizes.Go here to win and here to save (note these links will not work until 2/17 when the contest starts). Good Luck and let me know if you win!! Great post i like your blog you have a lot of cool things going on. Could you please stop by my blog, http://thecookinglady.com I have something for you.